May 21, 2018 5:00 P.M.
Mayor Brian Linin called the meeting to order with Vice-Mayor Jay Dee Brumbaugh, Commissioner John Garcia, and Commissioner Jacque Schields responding to roll call. Commissioner Annette Fairbanks was reported absent. Also present were Rich Simon – Director of Public Works, Dustin Bedore – Director of Electric Utilities, Joni Showalter-Police Chief, Alex Weis – Code Enforcement, Mary Volk – City Clerk, and Andrew Finzen – City Manager. Connie Nelson on behalf of Nelson Harvesting stated, I would like to discuss the letter we received regarding code enforcement for a junk yard. We do not want to be a junk yard. This is our business at 816 E. 19th We need to clean property up but most of it is to fix equipment for harvest. We are getting ready to leave for harvest in a week but we would like to work with the City. Is there someone that we can visit with us as to expectations? Andrew stated, you need to visit with Alex and have a dialogue to take care of it. Matt Murray representing Murray’s Custom Paint and Automotive stated, I own the business and am also not a salvage or junk yard, but an auto shop. I do not agree with letter but do agree there are some things that need to be cleaned up. This is my business and is what I do, just like other businesses around town. I attended a car show in Chicago where I chopped the top off a car for a customer out of Denver. He is familiar with my work and with proximity has asked me to rebuild the car with a radio airplane engine, similar to the pickup. Discovery Channel is filming episodes on me building the car. They want me to go to his shop in Denver, but I have asked them to come to Goodland. I sent pictures of my shop and they are talking about Discovery Channel shooting episodes here while I am working on car. There is also an organization that prints Trend Setter magazine twice a year. I was contacted by the owner who did an article of my shop in the magazine. I got recognition on a car I built a year ago that is on tour around the world. From that car I received work from Australia and Chicago. There is a lot of interest in old cars and what I am doing. Every day someone goes by and takes a picture and talks to me about my parking lot. In December I started a list of people that stop in; they are from all over world and generate a lot of traffic that people do not see. People have taken engagement and senior pictures on my lot. I do not want to put up a fence or get a salvage yard permit. I understand that things need to be cleaned up, but have been busy fixing cars from the hail storm a year and half ago. I want to paint building and haul some cars to farm to fix up lot and make it more appealing to public. I would like to do stuff like Rod Cooper did at old gas station. I own Dickey’s old gas station and have been gathering items to improve it and keep it from being an eyesore. We work hard bringing people here for car show, there is interest in old cars. Mayor Linin stated, I appreciate you coming to our meeting to discuss letter. We are trying to improve properties around town so appreciate sharing information with Commission to know what is going on. 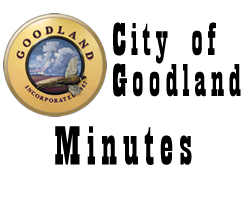 Goodland Regional Medical Center Update: Chris Smolik – Chris stated, we continue the regional approach with hospitals in Atwood and Oakley. The boards are meeting regularly and trying to homogenize hospitals and work on a name. We are working on by-laws for staff and board. Before summer we will have regional information out. Our main point is to scale hospital for small communities and share resources. We continue to work on leadership changes and drill down into employees our values. We maintain transparency of information. Radiology is getting new CT machine over Labor Day weekend. In April our expenses were higher than revenue, but ahead of last year. We are seeing our cash rebound with receivables decreasing. Cash on hand is about sixty-two days and would like to get one hundred days. We continue hiring employees from our competitors in Burlington and Colby. Electronic medical record conversion is on schedule to go live October 9th. In July we are starting new rotation with same faces in the ER. Our Home Health has come up with better ideas for marketing which has doubled our client base. The new Dermatologist group is starting in June. Our plan for first sixty days is to become acquainted with operations, then make capital purchases for them in fall so people do not have to travel for services. We are working to get information out to public. We introduced a new Cardiologist from Garden City today that will be great addition with his resume. Our goal is to offer a Kansas alternative to services. Our CFO has returned back to work. There are new members on the board and they are evaluating board size. We established a relationship with St. Francis and their clients coming to Goodland for OB. They lost their doctor as of Friday so our doctors are working with their PA’s. We signed contract with KU to get 4th year medical students in rotation at Goodland. If can have good rotations with them, it promotes our hospital. Currently have two students entering medical program from Goodland that want to come back here to practice. We are also starting to organize a small golf tournament later in summer. Donation of Old Police Vehicles to Northwest Kansas Technical College – Andrew stated, we have three decommissioned police vehicles; two are not in operation and one is not fit for service. We can scrap or sell for a few thousand dollars, but we are asking to donate to the NW Kansas Technical College to the CSI Program for forensic analysis and educational purposes. Jason Showalter from NW Kansas Technical College stated, we would like to thank the Commission for the opportunity to get a hold of old vehicles. We have a number of vehicles donated, and after a couple uses, we cannot use anymore. We use them for finger printing or education on bullet reactions. ON A MOTION by Commissioner Garcia to approve the donation of three decommissioned police vehicles to the NW Kansas Technical College for educational purposes seconded by Commissioner Schields. MOTION carried on a VOTE of 4-0. Unfit Structure: 1619 Kansas – Andrew stated, your unfit structure folders have information logged for specific property. For unfit structures at 1619 Kansas, 322 W. 7th and 823 Cattletrail there has been no correspondence from property owners and staff recommends putting properties out for bid. Mayor Linin asked, the owner of 1619 Kansas was previously here right? Andrew stated, yes, he wanted to demolish property but we have not heard anything since that meeting. Vice-Mayor Brumbaugh asked, what about cars on the lots when they bid to demolish the property? Alex stated, the bid is to clear the lot. Commissioner Garcia asked, when was the last correspondence with Carver? Alex stated, none since last meeting. ON A MOTION by Vice-Mayor Brumbaugh to solicit demolition bids for the properties at 1619 Kansas, 322 W. 7th and 823 Cattletrail seconded by Commissioner Schields. J. Howard stated, I am trying to contact property owner at 823 Cattletrail because that property can be saved; however, I have not been able to make contact. I would like to ask for thirty days to continue trying to make contact with owner. This would keep this property on tax role. Andrew stated, as a reminder, legal has advised the Commission against making agreements with people that do not have an interest in property. Alex stated, once property is out for bid you still have 30 day time line. Mayor Linin stated, we have a motion on the floor, is there an amendment. Vice-Mayor Brumbaugh asked, can you explain what you are saying about the legal advice? Mayor Linin stated, at 1619 Kansas we had citizens that did not own property request time to get in touch with property owner for improvements on the property. It is one of the properties on the list for demolition. Andrew stated, the nuisance process is between the City and property owner. When you interact with people not associated with property, it becomes a liability issue. Mayor Linin stated, my concern is with varmints inside the property. Alex stated, the property is not past improving but we cannot get property owner to respond. Vice-Mayor Brumbaugh stated, this property is different because it is newer and can be fixed. Alex stated, most of the damage is from hail storm. Commissioner Garcia asked, if property is submitted for bids, with the thirty day period, does she have to personally appear to Commission? Andrew stated, no she just needs to make contact with City Staff or Commission. Mayor Linin stated, we have three options, keep property in demolition process, fail motion or amend motion to where this property is included in demolition process, allowing a time extension. My concern with third option if we remove that property after bids are opened, is that fair to contractors submitting bids for demolition? Commissioner Garcia stated, we have to be sensitive to contractors. Commissioner Schields stated, I understand your reason to improve property but I feel since owner has not responded, she is not interested. Alex asked, what about accepting sealed bids but not opening bids on this property in the event contact has been made with J. J.? Commissioner Garcia stated, I feel we should amend motion so bids for 823 Cattletrail are not opened if contact has been made with property owner. Andrew stated, the Commission can dictate bids be open at their meeting. Vice-Mayor Brumbaugh amended his motion that demolition bids for three properties be open at first Commission meeting following thirty day time period seconded by Commissioner Garcia. MOTION carried on a VOTE of 4-0. Mayor Linin asked for a call on original motion as amended, solicit demolition bids for the properties at 1619 Kansas, 322 W. 7th and 823 Cattletrail to be opened at the first Commission meeting following thirty day time period. MOTION carried on a VOTE of 4-0. Unfit Structure: 322 W. 7th – See item B above. Unfit Structure: 823 Cattletrail – See item B above. Unfit Structure: 1405 College – Andrew stated, property owner is working with Alex. Directives from Commission were to replace porch and fix roof. He has removed porch and is soliciting bids for metal roofing. Shawn Davis stated, that is a 1907 Sears Roebuck kit home that I previously lived in. Staff recommends an extension for property owner to continue improvements on house. Curtis Hurd, citizen asked, can that roof stand any more weight? I would like to protest thirty day extension. He has lived across the street at least 15 years, and has never done any maintenance or repair to property. What constitutes fixing up property? If that was across the street from you it would have been gone. If we are going to clean up community, you need to clean it up. Vice-Mayor Brumbaugh stated, property owner has been in touch with me on property. I informed owner at hearing that I am not in favor of extension if there is not diligent progress made on property, I am still not in favor of an extension. This is not diligent progress for thirty days in my standard. If that is our standard we will be dragging properties out a long time. I agree with Curtis. I thought paint was part of any improvements; it should be. We are far from where property needs to be. Curtis stated, if City had not addressed property there would not have been anything done to it. Mayor Linin asked, how did property get on list? Curtis stated, I filed a complaint, other neighbor’s want to but do not want to make him mad. He lives next door to this property in a house that needs painted. Mayor Linin stated, I appreciate hearing from someone that is passionate about cleaning up community. Commissioner Garcia stated, we told him he needs to be aggressive on progress. Vice-Mayor Brumbaugh stated, yes we did and I was very clear I wanted diligent progress on property to be granted an extension. ON A MOTION by Vice-Mayor Brumbaugh to submit property for demolition bids seconded by Commissioner Garcia. MOTION carried on a VOTE of 4-0. Unfit Structure: 516 W. 15th – Andrew stated, Commission spoke with daughter at previous meeting, property is in probate. We are concerned if Commission continues to issue extensions while in probate, we will lose time. We recommend removing property from nuisance process and introduce again January 2019 when probate has been settled. The property owner has a citizen interested in buying and fixing up property so we would ask to wait till probate process is complete. Vice-Mayor Brumbaugh asked, what is time frame on Motel 7 and what was cost estimate? Andrew stated, property is in legal matter also and believe demolition estimate was about $40,000. Lawsuit is between current and previous property owners. There is also a small level of asbestos in property. Mayor Linin stated, I feel demolition could fall in $50,000 range. Is there an option to wait for probate process? Andrew stated, I can get legal opinion for next meeting. Alex stated, the granddaughter is taking over affairs and said they have someone willing to purchase property. Andrew stated, my thinking is continue working with them but drop property from nuisance process so we continue to get it addressed and can continue to work on other properties. ON A MOTION by Commissioner Schields to remove property from nuisance process and introduce again January 2019 or when probate process is complete seconded by Vice-Mayor Brumbaugh. MOTION carried on a VOTE of 3-1 with Commissioner Garcia casting the dissenting vote. Sand Volleyball Pit: Girl Scouts – Lori Amthor, Girl Scout leader stated, we have five girls working on silver award, the second highest Girl Scout award. They want to help put in outdoor volleyball pit for young kids. With this award the girls have to get involved in community and project by doing research and planning. We are asking permission from City for the girls to put in pit north of Water Park. We cannot submit application till have a project that will work so we want to see what is needed to start project. Project requires fifty hours per year and as a troop we want to see project through. Andrew stated, we are looking north of Water Park for a site. Vice-Mayor Brumbaugh asked, what are thoughts on adding a fence? Lori stated, we want to do pit for sure then see where we are. We want fencing and lighting but that will leave projects for future girls to obtain award. We would like to do volleyball tournament to help fund project. Commissioner Schields asked, what maintenance is involved? Andrew stated, expenses are a net and sand, so not exorbitant. Lori stated, we have thought about a rake and locker for disposal of cat manure that may get in pit. The girls have to find a project that is sustainable and the girls can do this maintenance. Consensus of Commission is to let the girls continue with sand volleyball pit north of the water park. Chicken Keeping: Debbie Goff – Andrew stated, Debbie could not make it to meeting but did indicate desire to reschedule. She reached out asking Commission to reconsider chicken discussion. The Commission discussed chickens in 2016 and voted to maintain code. Consensus of Commission is to invite her to next meeting. Mayor Linin stated, I do not know if she has new evidence but I feel she needs to be part in discussion. Centennial Park Fields – Andrew stated, the City received a Dane Hansen grant for playground equipment in the amount of $15,000. In addition we received a grant from Community Foundation for $5,000 and $10,000 from private donors to help replace equipment. I spoke with Tess at GAC, the infield material needs to be replaced in near future and to replace the four softball fields it will cost about $12,000. The southwest field has drainage issues so difficult to play on when rains. Tess indicated that field is not used half the time so propose using this field for the equipment, seed the infield and convert into play and picnic area. There has been other interest to put in shades and tables. We could convert the rest of field into two soccer fields and transition field into different use. Tess would also like to get a batting cage similar to baseball field which could be placed at this location also. It does not appear this proposal will cause issue with summer leagues. Park board agrees with transition and believe it will leave City in better position. Commissioner Schields stated, the equipment needs to be moved to new location as it is not safe in current location. Commissioner Garcia stated, I feel this is a good plan and helps with aesthetics of area. Vice-Mayor Brumbaugh asked, will the dugouts be removed? If we make this transition I want it to look like a play area, not an old ball field. If we retire other parks, maybe more equipment can be moved to this location. Andrew stated, yes if we retire other parks we will. ON A MOTION by Commissioner Garcia to proceed with transition of southwest softball field as presented seconded by Vice-Mayor Brumbaugh. MOTION carried on a VOTE of 4-0. City Managers Report- 1. City offices are closed Monday May 28th in observance of Memorial Day. 2. I have distributed handouts to Commission on budget schedule June 25th. Mayor Linin asked, can we consider two evening sessions for two hours instead of one all morning? I have distributed handouts to Commission on park maintenance and unfit structure list as requested. 4. The Museum and the Board are conducting a community survey to determine the direction of the museum. It will be an online survey available June 1-15. 5. Water Park is scheduled to open May 26th. 6. Rain over weekend caused problems at Wolak Building, City Office, City Shop and the Park Shop. 7. The KDOT building is being moved to Wilkens Truck and Tractor which will require a road closure on Highway 24. They are looking at the move this Thursday. Vice-Mayor Brumbaugh – 1. Appreciated public coming to meeting about letters they received. In looking at code violations, those are not instances in my mind where the issue is. This is not a new ordinance but an old one that has not been enforced. A junk or salvage yard is when that is their business and operated as such. These are both commercial issues, but we need to review because there is a discrepancy. In these two circumstances, this ordinance does not address their issue. Maybe I need to talk to Alex more to ensure accomplishing what Commission desires. Alex is trying to deal with ordinance that has not been addressed in years. 2. I received a complaint about an empty lot being used as motorcycle track. The neighbors have formed a petition and I encouraged them to come before the commission. Joni stated, they have been cited and it will be going through Municipal Court. 3. It has been a rough go on cemetery, with Memorial Day upcoming it is pretty tall. Andrew stated, I encourage everyone to go by, it looks much better today. It was a combination of the new seed and rain but continues to be addressed. Commissioner Fairbanks – 1. Absent, No Report. Commissioner Garcia – 1. I have the same concern as Vice-Mayor Brumbaugh on the letters that went out regarding salvage yards, they are separate issues. Mayor Linin stated, with the ordinance referred to in letter, the problem may be the definition of a salvage yard with residential property, where it is not allowed. Commissioner Schields – 1. I would like to thank the citizens for coming to meeting and giving us information. I appreciate the discussion on the ordinance and we need to look at issues. When an ordinance is not enforced for a while it becomes a problem. Mayors Report – Addressed Boy Scout Troop in attendance at meeting. Gary McClung, Troop Leader stated, they are achieving Civic Community badge and are required to attend a meeting then discuss an item from the meeting. Under authority of K.S.A. 75-4319 (b)(6) for a preliminary discussion relating to the acquisition of real property – Mayor Linin made a motion at 6:43 p.m. to recess into executive session under authority of S.A.75-4319 (b)(6) for preliminary discussion relating to the acquisition of real property not to exceed five minutes. I request the Commission, City Clerk and City Manager be present. Commissioner Garcia seconded the motion. MOTION carried by a VOTE of 4-0. Meeting resumed at 6:48 p.m.
Action from Executive Session – ON A MOTION by Vice-Mayor Brumbaugh to decline the proposal to purchase the road between Taco John’s and El Reynaldo’s seconded by Commissioner Garcia. MOTION carried on a VOTE of 4-0. Bobby Smith citizen stated, I am here concerning the decision to demolish my property at 1405 College. Mayor Linin stated, we received a complaint from a citizen on the condition of the property Commission approved tonight to solicit property for demolition bids. Bobby stated, it will not happen, my property is fine. I have removed the porch but cannot haul off because of mud and I have priced metal roofing. You asked me to remove porch and replace roof, which I am doing. Mayor Linin stated, we have approved to submit property for demolition. Bobby stated, this is the reason this town is dying. Mayor Linin stated, I take issue with that. The Commission’s role is to enforce code and ensure properties are up to code. Andrew stated, Mayor your agenda is complete and the meeting is concluded. Your meeting should be conducted in a productive manner. Bobby stated, I am not paying someone to demolish my house. I will tear it down myself. My neighbor needs to leave me alone. It takes money and I do not have it. Mayor Linin stated, if the house is torn down before bids are received in thirty days there will be no bid award. ADJOURNMENT WAS HAD ON A MOTION Vice-Mayor Brumbaugh seconded by Commissioner Schields. Motion carried by unanimous VOTE, meeting adjourned at 6:55 p.m. Next meeting is scheduled for Monday June 4, 2018.